Some of our favorite sustainability links. Learn more here. The Global Footprint Network offers a calculator to estimate how much land area it takes to support your lifestyle. Use a Carbon Calculator to create a personal pollutioninventory and learn how to be part of the solution!Then offset your carbon emissions through a service such as Carbon Footprint Ltd, Native Energy, CarbonFund, or TerraPass. How can Trees contribute to the solution? i-Tree from the USDA Forest Service helps you calculate the environmental benefits of trees - stormwater capture, energy savings, carbon capture and property values. Did you even know you had a Nitrogen Footprint? Find out what an N-print is and why it matters, calculate your own, and then do something about it! And now for the real eye-opener: Calculate your Slavery Footprint! Take the survey and find out how many modern-day slaves work to make the things you buy. Now that you know, take ACTION! These tools can help inform, sustain, and track your personal actions for sustainability: Joulebug (sustainability mobile app), GoingGreenToday (personal green coach), Energy Efficiency Mobile Apps. Need a Sustainability Speaker? Check out the Partnership for a Green City's local Speakers Bureau. Partnership for a Green City - A collaborative effort to improve sustainability internally and in the community by four of Louisville's largest public entities: Louisville Metro Government, University of Louisville, the Jefferson County Public Schools and Jefferson Community & Technical College. Follow on Facebook. Grassroots network to inspire the development of a resilient and sustainable community - for those who seek a sustainable, local-scale implementation of the Transition Model. Act Locally, Share Globally! Follow on . A network of students and student groups from across the commonwealth who are united in their concerns about environmental injustice and the impacts that climate change will have (and is already having) on our lives. Follow on or Twitter. Working to make sound environmental stewardship a priority for Kentucky's elected officials and voters. The Passionist Earth & Spirit Center on 21 acres of greenspace along Beargrass Creek (1924 Newburg Road, Louisville, KY 40205) offers sustainability programming throughout the year and an Environmental Leadership Program for people who are passionate about environmental issues and want to make a difference. Similar to an internship, participants choose from a range of projects that match their interests and inclinations. 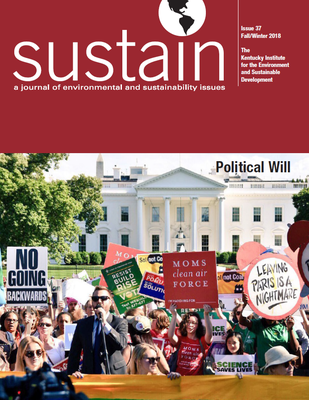 Sustain: A Journal of Environmental and Sustainability Issues - Published twice a year by the Kentucky Institute for the Environment and Sustainable Development at UofL. Kentuckiana Green - A local environmental news service of The Courier-Journal. Ecoshock Radio - Latest science, authors, issues - climate change, oceans, forests, pollution, peak oil, the economy, and peace. Yes! Magazine - Powerful Ideas, Practical Actions: A Journal of Positive Futures. Concerned with building a more just, sustainable, and compassionate future with articles about economic alternatives and peace options. GOOD Worldwide - a collaboration of individuals, businesses, and nonprofits pushing the world forward. "For people who give a damn." Sustainable Kentucky - Going Green in the Bluegrass. Connecting sustainable living folks throughout the Bluegrass state with information, ideas, and events. Website. Earthscan - A blogging community of the world's leading sustainability experts. TreeHugger - A leading media outlet dedicated to driving sustainability mainstream. EarthTechling - The place for green technology news and features. EcoGeek - Devotes its pages to exploring the symbiosis between nature and technology. SmartBrief on Sustainability - a daily briefing on sustainable business. Democracy Now! - A daily news program highlighting stories about social and economic justice, hosted by Amy Goodman and Juan Gonzalez, airing on over 850 stations, pioneering the largest community media collaboration in the U.S.
Sustainability Research & Policy Network - a worldwide, online community for research in all areas of sustainability and policy, featuring eJournals in 25 different sustainability subject matter areas. NCSE Affiliate News Services - a daily feed of global environmental news from the National Council for Science & the Environment. E&E Publishing - The premier information source for professionals who track environmental and energy policy. 53 Sources for Climate Change News - published by George Washington University's Milken Institute School of Public Health. 99% Invisible Podcast - "Undesigned" (4:31): Why are we so wasteful? Almost everything in modern life is designed to waste energy. The whole system evolved on a false premise that petroleum is cheap and plentiful and will be that way forever. Climate Fixes - tools and resources to help you communicate your support for climate solutions to policy makers. Project Drawdown - The most comprehensive plan ever proposed to reverse global warming. Our organization did not make or devise the plan—we found the plan because it already exists. We gathered a qualified and diverse group of researchers from around the world to identify, research, and model the 100 most substantive, existing solutions to address climate change. What was uncovered is a path forward that can roll back global warming within thirty years. National Renewable Energy Laboratory - Check out their handy Interactive Mapping Tools, including the excellent Biofuels Atlas. Energy Action Coalition - The hub of the youth climate movement and organizer of Power Shift. The Solutions Project - Accelerating the transition to 100% clean, renewable energy for all people and purposes in the U.S. Through media, storytelling and events, you can see that 100% is possible, happening and for us all. Experience the benefits, join a growing community, and take action today as part of the 100% campaign. Check out the 100% Renewable Energy Vision for Kentucky! Earth Deeds - Supporting local solutions to global warming through innovative online tools for understanding carbon footprints and then transforming them into sustainability projects. The site lets individuals, institutions, or groups (such as Study Abroad trips) "onset" carbon emissions by funding local projects. Solar Action Alliance - Explore the power of the sun and learn what you can do to harness and promote solar power! The Climate Data Factory - Providing quick and easy access to future climate information over 4,300 cities and 70 countries worldwide, produced by an international team of climatologists working on making climate information more usable to a broader community. Campus and Course Conversations - Offering a practical and powerful approach to support the rising spirit of citizens coming together, outside of the partisan bickering, to create new relationships, to spark opportunities and to encourage sustained engagement to address local and national challenges. It is an adaptation of Living Room Conversations where the conversation is taken one step further by converting the conversations students hold into action. The current topic of discussion is energy. U.S. EPA's Greenhouse Gas Equivalencies Calculator - Did you ever wonder what reducing metric tons of carbon dioxide emissions means in everyday terms? This calculator can help you understand just that, translating abstract measurements into concrete terms you can understand, such as "equivalent to avoiding the carbon dioxide emissions of 183,000 cars annually." Heliomap - An immersive, easy to use 3D solar estimator tool created by UofL alum, Sam Ellis. Users can quickly find out the solar potential of any property and connect to local installers. House-Energy - Tips and information to help homeowners reduce energy use and carbon emissions. Interactive Transparency: America's Energy, Where It's From and How It's Used - From GOOD Worldwide - "For people who give a damn." Climate Feedback - A scientific reference to reliable information on climate change. Separate the facts from the fiction in media coverage about climate change. Got Science? Test your global warming smarts and earn a free "Got Science?" sticker from the Union of Concerned Scientists. Just Science - a free mobile app for translating the science of climate change into layperson's terms. The app takes two centuries of data from the comprehensive Berkeley Earth Surface Temperature (BEST) study, then converts it into a color-coded moving map that shows how today's monthly temperatures compare to historical averages since 1800. Appalachian Solar Showdown - How does Kentucky stack up to Tennessee, North Carolina, Virginia and West Virginia, when it comes to taking advantage of renewable energy opportunities? This handy infographic from the Renewable Energy Corporation compares states based on: number of solar jobs & solar homes, grading of net metering policies, renewable portfolio standards and ranking of each state’s electricity prices. Tipping Point: Near-Term Systemic Implications of a Peak in Global Oil Production - a report by David Korowicz of Feasta and the Risk/Resilience Network which argues that the defining dynamic of our civilization is the withdrawal of energy from a complex and integrated system adapted only to growing. A managed “de-growth” is impossible; what is required is rapid emergency planning coupled with a plan for longer-term adaptation. Article by Brad Plumer (Vox, Sept. 2016): Yes, the climate has always changed. This comic shows why that’s no comfort. Watch the planet warm with NASA's 26-second animation of global temperature changes 1884-2011. Countries most exposed to the carbon bubble - An interactive map revealing which nations' stock exchanges are most exposed to the 'carbon bubble'. Time to leave GDP behind (Nature, Jan. 16, 2014) - Gross domestic product is a misleading measure of national success. Countries should act now to embrace new metrics, urge Robert Costanza and colleagues. What's behind a t-shirt? NPR's Planet Money Team follows the making of a regular t-shirt from cotton seed to your home. Find out what people, resources, technologies, machines, and shipping is required to make the things we take for granted. Sustainability Career Resources - Offering information about green careers in sustainability with links to hiring organizations! Native Plant Finder - An easily searchable database from the National Wildlife Federation to help you identify what plant species are native to your region. The Louisville Food Blog - Your home for food justice happenings in Louisville, KY! Louisville Food Ecosystem Map - Discover food pantries, farmers’ markets, grocery stores, and other food providers and how they relate to income-poor ZIP Codes. Prepared in 2018 as part of the Community Foundation of Louisville's Hunger Innovation Fellowship which was funded to provide social, intellectual, and financial capital to research opportunities for systems-level change within Jefferson County, Kentucky’s food ecosystem, which could help elevate and accelerate current efforts to end food insecurity. The Food In Neighborhoods (FIN) Community Coalition provides a wealth of resources, including those compiled by the Urban Agriculture Coalition (find gardens, calendar, directory, discussion forum, and resources for growers). La Vida Local - A weekly sustainable & local foods program that airs on Louisville's Crescent Hill Radio. Real Food Challenge - Uniting students for just and sustainable food. Eating Green Calculator - Get a handle on the impact of your eating habits and the benefits of eating differently! From the Center for Science in the Public Interest. Factory Farm Map - A project of Food & Water Watch. The Organic Green Revolution - A report from The Rodale Institute. Meat is Horrible - An analysis of the environmental impacts of meat production (Washington Post). How to win a Food Fight - Healthy choice comparisons from the YMCA of Greater Louisville. Louisville Farmers Markets Association's Local Food Resource Guide - Find freash, local food near you at area Farmers Markets, Fresh Stops, and Healthy In A Hurry corner stores. Louisville Farmers Market Directory - Dozens of seasonal and year-round farmers' markets take place all around town just about any day of the week. Louisville Farm-To-Table - Bringing together area farmers and their locally-grown foods with Louisville consumers in their homes, schools, restaurants, and workplaces. Kentucky's Online Farm Market - Buy/sell/trade locally grown food. Establishing Urban Agriculture in Your Community: What you need to know before you get your hands dirty. EPA: Urban Agriculture & Improving Local, Sustainable Food Systems - Information for people pursuing agriculture projects as a part of brownfield redevelopment and reuse. The Lexicon of Sustainability - A multi-platform project based on a simple premise: people can’t be expected to live more sustainable lives if they don’t even know the most basic terms and principles that define sustainability in relation to food and agriculture. Natural Standard - is the only evidence-based source for complementary and alternative medicines. Its evaluations of therapies and supplements and are based on the medical literature and graded on an A-F scale. Provided by UofL's Kornhauser Health Sciences Library. Ralph B. Knollenberg III Foundation - Youth Gardening Internships available! GreenList Louisville - Your guide to sustainable living. Find local products, services, events, and organizations. A Mighty Kindness-Listing sustainable services & community groups of our eco-region (within 100 miles of Louisville). Learn about The Benefits of Buying Locally! Better World Shopping Guide- a comprehensive, up-to-date, reliable account of the social and environmental responsibility of every company on the planet. Responsible Shopper- Green America's guide to promoting a responsible economy. Good Guide - an online tool and mobile app for scoring the environmental, health, and social impacts of many products on the marketplace. Proud Green Home - resources for creating, remodeling, and sustaining extraordinary homes. The Complete Green Home Guide - a handy task list for those who want to save money and save the planet. Slavery Footprint - How many modern-day slaves work for you? Take the survey! Global Peace Index - A comparison of nations based on the number of internal and external conflicts fought. Race Forward: The Center for Racial Justice Innovation - conducts original and broadly accessible research on pressing racial justice issues. Their research is focused on the ways institutional and structural racism leads to inequitable social and economic outcomes in our society and highlighting ways to nurture and strengthen social change. Student/Farmworker Alliance- a national network of students and young people organizing with the Coalition of Immokalee Workers to uproot exploitation in the fields and build a food system based on justice, respect and dignity for farmworkers. How to Build a Global Community - From the Syracuse Cultural Workers. Bellarmine University's Center for Regional Environmental Studies. Berea College - Sustainability Initiatives. Eastern Kentucky University - Responsible Environmental Stewardship. Jefferson Community & Technical College - JCTC is going Green. 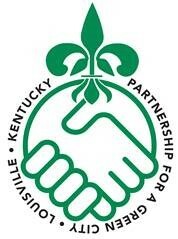 Kentucky Community and Technical College System - The KCTCS Sustainability Initiative. Morehead State University - Going Green @ MSU. Murray State University - M.S. in Sustainability Science. Northern Kentucky University - NKU Goes Green (Facebook). Spalding University - Green Initiative Team. Transylvania University - Crimson goes green. University of Kentucky - Office of Sustainability. Western Kentucky University - Office of Sustainability. Potlux - An online platform for the free exchange of ideas and best practices in campus sustainability. Peruse a catalog of initiatives to learn about other colleges’ practices and their key contacts, or share your own! What's your neighborhood's Walk Score? A simple tool for calculating neighborhood walkability, bikeability, and access to transit - key components of urban sustainability. Bike Louisville - Metro Government's bicycle related efforts. Check out the Louisville's Bike Master Plan. Carbusters - Journal of the carfree movement. Cycle Chic - Real people riding bikes in street clothes. Fun. Awesome. Hip. Pedalaround - Louisville's Kirk Kandle provides an inspirational and practical voice for people who get around on bikes or want to! Clean Air Task Force - Health impacts of diesel use in Jefferson County. How much are you really paying to drive? - AAA's annual reports show the average person in the U.S. shells out over $9000/year! And that's without considering all of the "external" environmental, social, health, accident, and infrastructure costs! The Lexicon of Sustainability - A multi-platform project founded by Douglas Gayeton and Laura Howard-Gayeton to use information art to help us all speak the same language when it comes to sustainability. Guide to Data Science and Sustainability - an overview of the intersection between Environmental Science and Data Science and how the two can be combined to better tackle sustainability issues. Includes recommendations on how to become a contributor to the sustainability movement as well as sustainability career resources. The Living Principles for Design - A place for the global design community to co-create, share and showcase best practices, tools, stories and ideas for sustainable design across all disciplines. Active Design Guidelines - NYC's exemplary manual of strategies for creating healthier buildings, streets, and urban spaces. Encyclopedia of Earth - An electronic reference about the Earth, its natural environments, and their interaction with society. Green Cities : Good Health - Evidence of the connections between human and ecological health in our cities. Learning for Sustainability - Resources to help us address and manage the social and capacity building aspects of sustainable development and other related complex issues. Worth Dying For: A 5-min video tribute to those who have died in defense of Planet Earth. The Story of Stuff - 20-minute animation about our consumerist society, narrated by Anne Leonard. Earth911 - Solutions for products' end-of-life for both businesses and consumers. African-American Environmentalist Association - Basic recycling facts. How To Compost - A hub for all composting information. DonorsResource.org - Don't trash it, donate it! This platform helps you find a local nonprofit organization that needs the items you want to donate. Learn what can be recycled in Louisville, including electronic waste!